2. 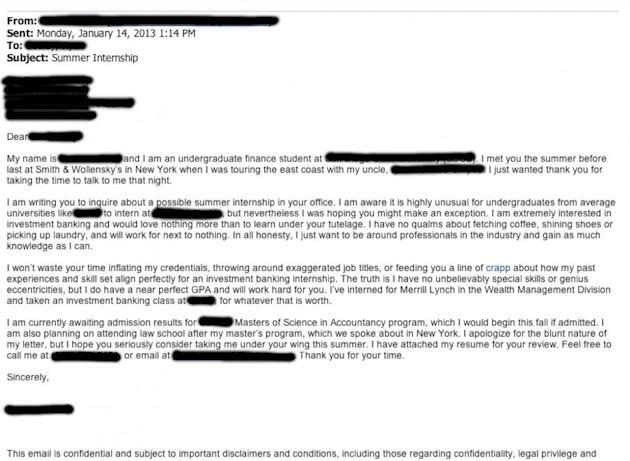 A student sent an unapologetically honest cover letter to an investment bank and people on Wall Street called it one of the best CVs they have ever seen. It spread from bank to bank and sites like Business Insider picked it up. "No joke, I think we should consider this guy," one banker wrote. "I wouldn't be surprised if this guy gets at least a call from every bank out there." 3. 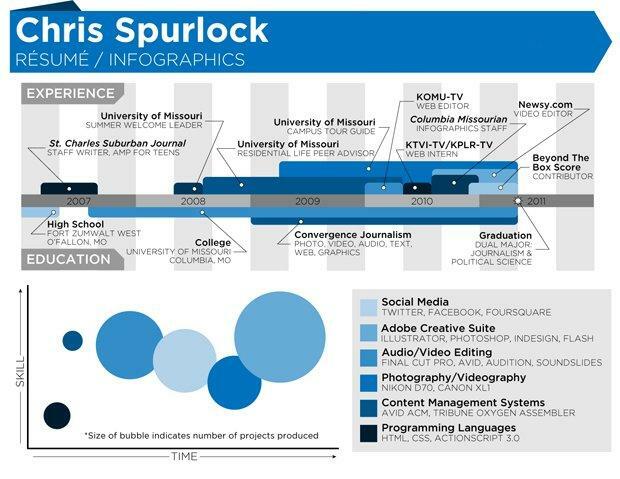 Another student, Mizzou's Chris Spurlock, designed a resume that looked like an infographic with the help of a fellow photojournalism student. It was featured on HuffPo College and tweeted more than 5,300 times. After the post received tens of thousands of pageviews, The Huffington Post hired Spurlock as its Infographic Design Editor. 4. Philippe Dubost is a web product manager who really wants to work for Amazon. He built a website that looks like a product page complete with a shopping cart and ads. It was tweeted by Yahoo Finance, Y Combinator and nearly 300 others. 5. 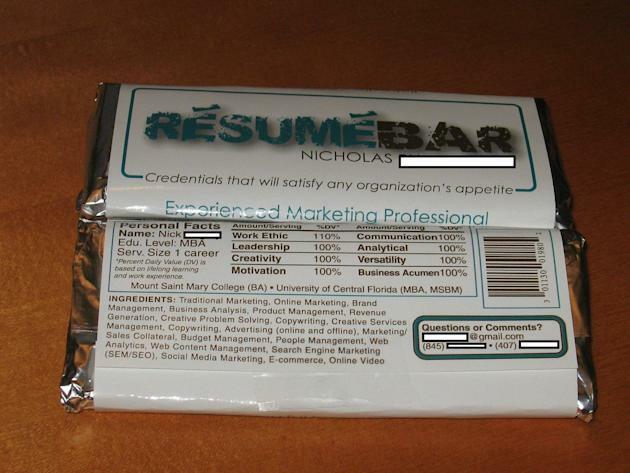 This person turned his resume into a chocolate bar and was hired. His chocolate resume was picked up on Reddit and viewed more than 1 million times. 6. 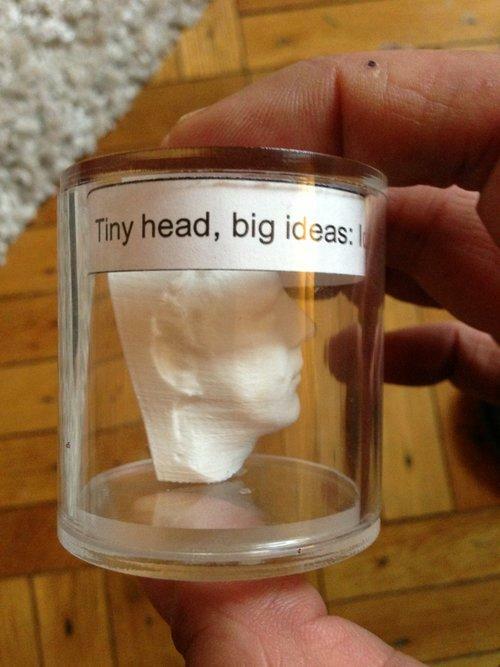 A freelance creative in NYC decided to get noticed by 3D printing his head at Makerbot's headquarters and sending it to prospective employers with the tag line: "Tiny head big ideas." It was featured on PFSK. 7. Alice Lee skipped four classes at UPenn to create a website/resume for Instagram, DearInstagram.byAliceLee.com. It didn't get her hired, but she did speak with founder Kevin Systrom on the phone; she ended up landing an internship with Path. Business Insider, The Atlantic and The Next Web wrote about it. 8. 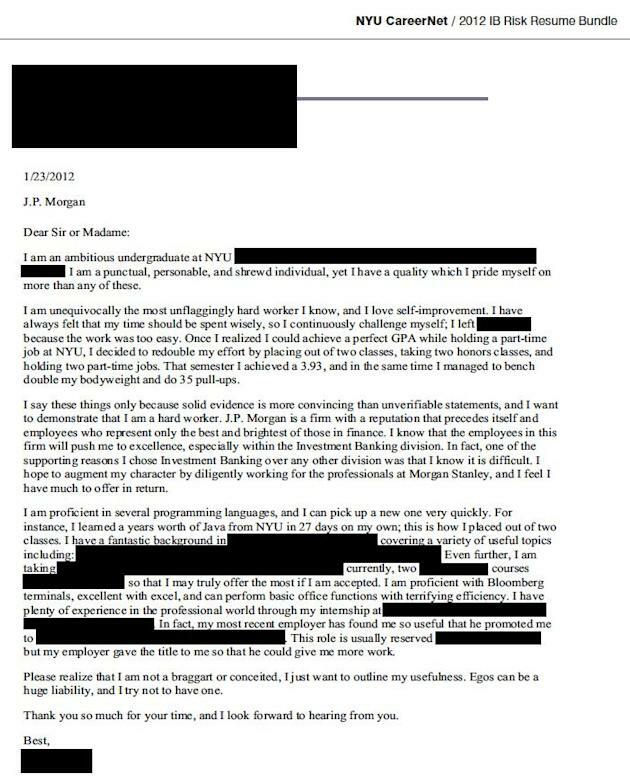 An NYU junior named Mark sent an overzealous CV to J.P. Morgan last year. It boasted his ability to do 35 pull-ups and quickly became the laughingstock of Wall Street. It was read by Goldman Sachs, Morgan Stanley, Nomura, Citi, Deutsche Bank, PricewaterhouseCoopers, KPMG, Wells Fargo, Keefe, Bruyette & Woods, Perella Weinberg Partners, and Barclays Capital employees who forwarded the letter with responses such as: "Prepare to lol all over yourself." 9. 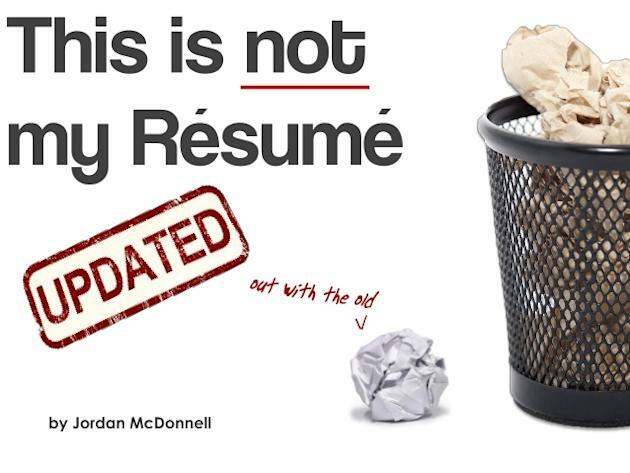 Financial analyst Jordan McDonnell wanted to change careers, but he had trouble getting his foot in the door. So he created a non-resume to show off his creativity. It was viewed about 90,000 times in one week. 10. Perhaps the most viral resume of all time belongs to Aleksey (Vayner) Stone, who submitted a 7-minute video resume titled "Impossible is Nothing" to UBS when he was a senior at Yale. He also submitted a glamour shot, a 1.5-page resume and an 8-page writing sample. The video showed Stone ballroom dancing and bench pressing nearly 500 pounds. Unfortunately the video went viral in a bad way, and Wall Street made a mockery of Stone. A few weeks ago, Stone passed away at age 29 from a drug/medicine-induced heart attack.